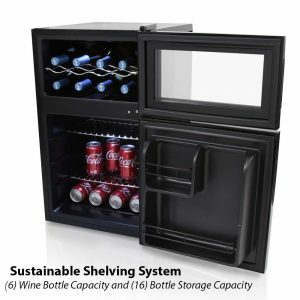 NutriChef PKTEWBC240 by Sound Around is a compact dual door 2-in-1 mini fridge and wine cooler with a 6 bottle wine cellar at the top and a 16 can beverage fridge at the bottom. It has a beautiful state-of-the-art modern design that makes it good for freestanding or standalone use in any convenient spot at your home or office. With a sleek design and the measurements of 16.9 x 20.5 x 29.1H inches (weighs 51.9 pounds) you can put it against a wall, on the countertop in your kitchen or on a table or anywhere you want. The power cord is 5.5 feet long and shall be able to reach the power outlets from a distance. The total capacity is 69 liters or 18.23 gallons inside and the wine and beverage sections have separate doors. You’ll find three sturdy chrome shelves inside the fridge that slide out easily and lets you organize your stuff better. The top wine cellar has the translucent glass window that lets you see your bottles without needing to open the door. With the efficient thermoelectric cooling system this great fridge cooler runs with a very low noise level and without the vibrations. Thanks to this premium cooling consistent temperatures are maintained for the best flavors and texture of your wines over time. The top and the bottom parts are cooled separately with different temperature ranges and settings. The upper zone for the wine is between 46 and 64 degrees Fahrenheit (8 – 18 degrees Celsius). And the lower zone temperature range is 37° – 64° F (3° – 18° C). So the maximum temperatures reached are the same but the lowest temperature is 9 degrees less for your beverages. It has the user friendly dual digital touch button controls on the display panel by which you can change the temperatures in both zones, Celsius/Fahrenheit and turn on and off the LED lights inside. You can fit 6 standard sized and shaped Bordeaux style wine bottles in the upper section and up to 16 x 330ml or 12 oz size cans in the lower section. The whole fridge is stain resistant and very easy to clean. The integrated circulation fan and ventilation grill help with maintaining the consistent and precise temperatures throughout the interior, along with moisture control necessary for the better aging of your wine bottles. 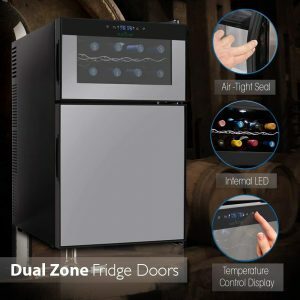 NutriChef PKTEWBC240 is a great value beverage fridge and wine cooler in one, that is suitable for use in home kitchens, family rooms or personal bars and we do not recommend its use in commercial settings.